Over 300,000 technical specifications available on demand. Don’t see what you need – call us. Built in estimate writing software that uses crowd-sourced repair times. Add your own repair times and parts to any estimate. Access our training courses for aspiring motorcycle technicians and those looking to further their education. If you are trying to run a business, why waste time or risk the liability of looking for illegally pirated PDF manuals or browsing forums for information you hope is correct? Don’t keep a job held up waiting for accurate repair information. 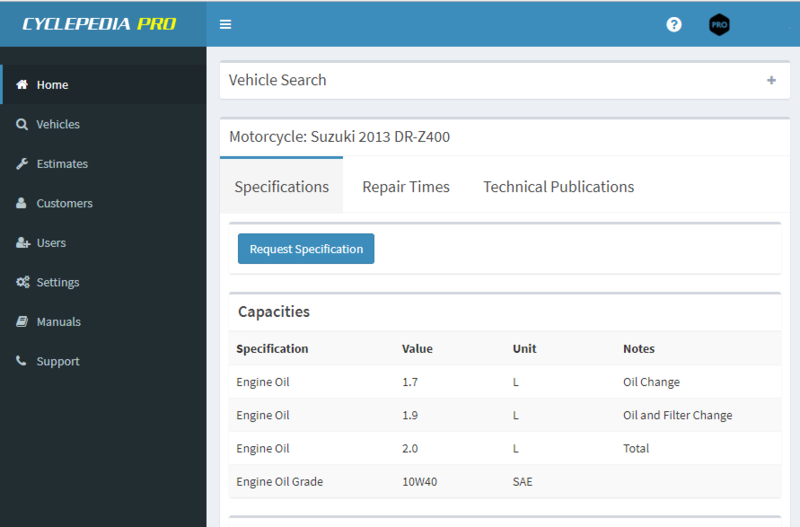 Get the information you need with Cyclepedia PRO – you’ll get 24/7 access to our Specification and Repair Manual Database. If you need more information don’t worry – you’ll get access to our tech-line where you can speak one-on-one with a dealer trained technician. Every manual we’ve written is based on a complete teardown and rebuild so we are intimately familiar with the vehicles we cover. See why so many dealers are choosing Cyclepedia PRO – we’re here to help your business be successful! I’ve been using the Autodata labor estimator but I find the Cyclepedia Pro system is actually better and well worth the money. I appreciate your fast responses to my questions which is another reason why I would rather work with your company. – Richard B.
I have nothing but good things to say about Cyclepedia when I couldn’t find something I called and they had the answer and was told it would be updated over night. I checked the next day and it was already updated I was very impressed. Thank you keep up the good work. – Toby D.
You guys have made it really easy to run my small shop. I can get all the specs I need quickly and when you haven’t had something you always respond fast. I had a subscription to another site full of pdf manuals but they got shut down. It’s nice that I can call you and talk to real people. Keep up the good work! – Alfonse G.
I thank you for the Cyclepedia Pro subscription with all of the manuals. Unfortunately, I don’t know English at all. Photos from your site and the automatic translator helped to understand some aspects of repair completely. Thanks! – Anatoly R.
Its a wow factor for the customers to see the Cyclepedia Online Manuals pulled up on my tool box laptop. The PRO subscription is very handy. – Michael N.
We run a small shop working on mainly dirtbikes and snowmobiles and have repeatedly used Cyclepedia manuals to help us out. You guys have been really great. – Scott S.
I have just renewed our subscription to your online motorcycle manual database for yet another year. Love the product! Keep up the good work. – Mark. R.
I have to say that your manuals are incredibly helpful. We have been able to extend the range of services we offer to our customers. Keep up the good work! – Matt H.
I believe Cyclepedia.com is a GREAT resource. As a professional tech, it’s the best motorcycle resource I’ve seen. I believe experienced techs and average motorcyclists with little or no tech skills will find the resource more useful than printed service manuals. The information is clear, easy to follow, and well illustrated. – Mark S.